In a carved gilt-wood frame; the reverse with an old label inscribed 'P4749' and with evidence of a sketch drawn into the terracotta with a stylus. Minor chips; cracks and damages to frame. J. MONTAGU, ALESSANRDO ALGARDI, VOL. II, NEW HAVEN AND LONDON, 1985, PP. 307-309, CAT. NO. 4, FIG. 189. THE PRESENT TERRACOTTA IS A SIMPLIFIED VERSION OF A RELIEF BY ALESSANDRO ALGARDI, WHICH IS KNOWN IN SEVERAL EXAMPLES IN BOTH TERRACOTTA AND BRONZE. ALTHOUGH THE WORK DOES NOT APPEAR TO BE DOCUMENTED, ITS ATTRIBUTION TO ALGARDI HAS BEEN VERIFIED BY AN ENGRAVING EXECUTED BY EDWARD LE DAVIS (C. 1640-1684). IN MANY OF THE VERSIONS KNOWN, THE COMPOSITION IS PLACED IN AN OCTAGONAL RELIEF, WITH AN ANGEL TO THE LEFT HOLDING UP A CURTAIN ATTACHED TO A TREE TO THE RIGHT, AND WITH A NATURALISTIC PUNCHED AND ENGRAVED GROUND BENEATH THE FEET OF THE FIGURES. 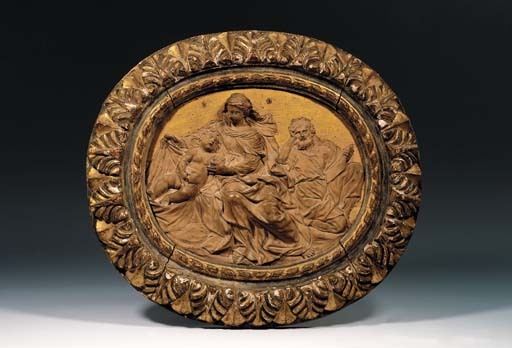 HOWEVER, IN THIS OVAL RELIEF THE THREE FIGURES HAVE BEEN ISOLATED AND PLACED AGAINST A PLAIN GILT GROUND, EMPHASISING THE CONTEMPLATIVE RATHER THAN NARRATIVE ASPECTS OF THE SCENE.